Would you like to donate to your favorite shelter? Choose your state below to find your shelter's page! Would you like to donate a Kitty Crib or a Studio Living Cage Insert to your preferred shelter? Just select your state to find your shelter. If you do not see your shelter listed, let them know, so they can register by using the form below. For assistance contact sales@crijopets.com or call 1-256-403-2605. Are you a shelter wanting to register for Crijo's Donate program? It's easy! Just submit the form below, and we'll create your custom page, then send you the link so you can include it on your shelter's website, or share it via social media! Used with your image(s) on your custom page. Unfortunately, there are many valid reasons cats in shelters must sometimes spend time in cages; intake, isolation, sickness or behavior issues, just to name a few. Just being in a cage is stressful for a cat. Enrichment that can be introduced to the cage environment helps reduce stress making for a healthier, happier and more adoptable cat. 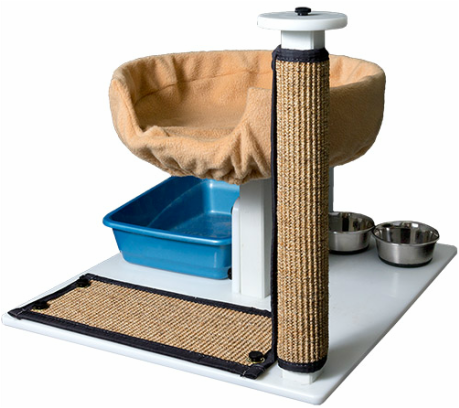 CRIJO addressed this issue by developing the perfect enrichment product for cages, our Kitty Crib Cage Insert allows for separation of the food and litter, offers a sisal mat and an optional post for scratching and provides a resting place that allows a cat to be up "high" in the cage. Our Studio Living Cage Insert offers many of the same benefits as the Kitty Crib, for large cages. 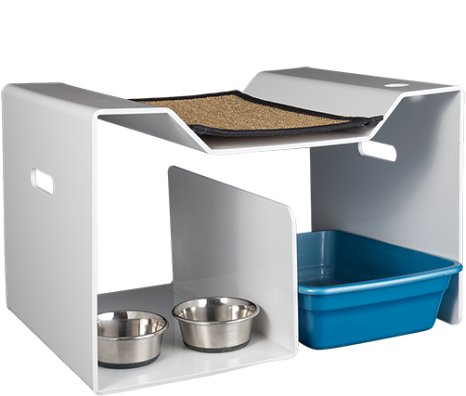 Many shelters have signed up to take part in our Kitty Crib Donation Program. Your local shelter may be one of them; by using the form at the bottom of this page. WE NEED YOU to register so that others can donate a Kitty Crib or Studio Living cage insert to help YOUR cats in cages.